The three and half year old high profile relationship between Desmond ‘Stunner’ Chideme and Big Brother The Chase evictee Pokello Nare officially ended on Wednesday. This follows Pokello’s declaration to journalists in the capital that she will wait for her new found younger love, Ghanaian tailor and actor Elikem Kumordzi, who is still part of the reality television show. Stunner also confirmed that the shattering news was communicated to him on Wednesday. Interestingly, both Stunner and Elikem are tailors an indication that Pokello has a ‘thing’ for such men. In a candid interview Stunner said although he did not expect Pokello’s decision to end the relationship, he has accepted it and was moving on. He revealed that he has found new lovers- music and his daughter Celeste. “Well, naturally I didn’t expect the relationship to end but I respect her decision. I don’t even know what came up to her but I have her best interest at heart so I can’t be forcing her into stuff she doesn’t like. “Just as much as she has moved on, I will also move on and I have immediately found my lover that is my daughter Celeste and my music. Now my full love is on music and taking care of my daughter,” he said. 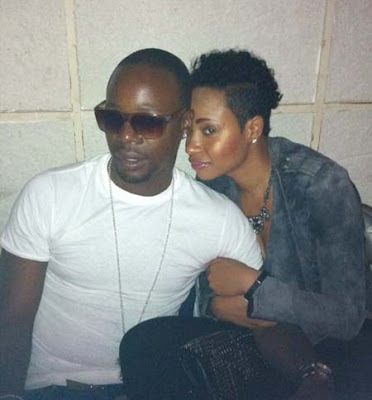 “Me and Pokello are cool. People out there might not know what’s going down and all but we do so we are cool. We can greet in the streets and her call wouldn’t hurt just as much as my call wouldn’t hurt as well, we cool like that,” he added. In revealing that his new love was MUSIC and taking care of his daughter, Stunner was insinuating that Pokello was a stumbling block in that respect. He however cleared the air: “No, no I am not saying she really a stumbling block but I am saying WITHOUT Pokello, my music now has NO boundaries. “Something she would stop me from writing some songs for some reason suiting her but now I am a sole trader, one ari ega and I will be out in full force busy with my number one love music. “I will be writing my songs straight for my heart and will be back to the old Stunner you knew before Pokello, the man who brought you Team Hombe, Dhafu Korera and so forth. At the same time, I wish Pokello the best in her endeavours, she is quite a go-getter and hard worker,” said Stunner. When asked to comment on Pokello’s utterances that Elikem is a BETTER man, Stunner replied: “Well, if she said so that means she might have found better in him but I hope he remains the same even when he is not on camera. Stunner also refuted claims that the collapse of the relationship means that he was finding his way back to his family hood in Glen Norah. He articulately pointed out that he was a hustler and moved out of his family home soon after high school. “My brother Stunner has taken care of himself ever since. How does Pokello take care of me and why would she do that? I have in fact stayed alone at the same flat with some people who work at your offices and they can testify. “As much as Pokello is streetwise and a hustler in her own right, it’s the man’s job to take care of a woman, its mere speculation from people who don’t know me. Ask my friends and people around me to tell you how me and my boys struggle and hustle to get the bills paid. “When I left Prince Edward school I had lots of connections who I linked with in my hustles, I have sewn clothes, sold movies, every hustle you can think of, I pay my own bills,” declared Stunner. Stunner is known to sweep women off their feet and this fuelled speculation that during the two months that Pokello was ‘playing games’ with Elikem- he too had enough time and space to hook up other girls. He however watered down such speculation arguiung that he had no time for that since he spent all his time watching Big Brother The Chase . “Man, I had no time for that I was busy campaigning for Team Pokello but after she was evicted TV yangu haichabata channel 197/8,” said Stunner in jest. “That’s some private information between me and Pokello but all I can say is SHE SAW ME FIRST.” He also vowed that he will never bad mouth Pokello in any way or in any song.